Females lay 2 eggs in several clutches. Ranges from deserts to the rainforests. Geckos have adapted a great variety of habitats. Native to south and south-eastern Asia including Malaysia and the Philippines. Can also be found in the Indonesian archipelago. Has been introduced to Florida, Texas, Hawaii, some Caribbean islands and Belize. 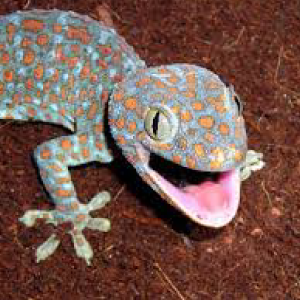 Geckos are quite vocal making sounds that range from quiet chirping to loud barking. Only the male gives voice, the female is mute except for a defensive hissing sound. Gecko’s eyes only see in black and white. Because they are nocturnal they have no need to distinguish colors.